Over the past few months, AIDS activists have been protesting a decision of the Milton Hershey School to deny admission to an HIV-positive 13-year-old boy. The AIDS Law Project is challenging the school’s decision in federal court as a violation of the boy’s civil rights (Smith v. Milton Hershey School). Beyond the lawsuit, the AIDS Healthcare Foundation has been organizing protests against the Hershey School, which is legally separate from the Hershey Company, but receives its funding from the Milton Hershey School Trust, which has the controlling interest in the candy company. The Foundation is pressuring the Hershey Company nevertheless with its “No Kisses for Hershey” protests held in San Francisco, Los Angeles, New York, in the Hershey, Pa. area itself, and as far away as New Delhi and Mexico City. Especially poignant was a statement released by Jeanne White Ginder, the mother of Ryan White, whose rejection from school because of his HIV-positive status lead to the landmark Ryan White CARE Act. “The news that in this day and age, the Hershey School rejected a 13-year-old boy due to his HIV positive status brings back horrible memories of what Ryan had to go through twenty-seven years ago when all he wanted to do was simply to go back to school,” White Ginder’s statement read. As protests were being held in the week leading up to Easter, Hershey chairman James Nevels was scheduled to deliver the “CSR Keynote Address” at the International Corporate Citizenship Conference sponsored by the Boston College Center for Corporate Citizenship. 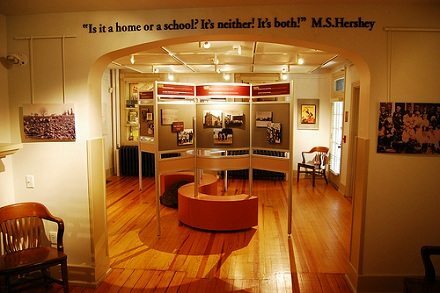 The speech was titled, “Commerce & Compassion.” In the promotional CSR materials distributed by Hershey for the event, the company lauds the Milton Hershey School, noting, “Students of the Milton Hershey School are direct beneficiaries of The Hershey Company’s success.” Nevels devoted seven paragraphs of his speech to the Hershey School and also showed his audience a 60-second commercial for the school. The boy, referred to in court documents by a pseudonym, had been declared qualified for admission until school administrators learned that he was HIV-positive, at which point the process apparently stopped. The school has allegedly never spoken to the boy, his parents, his current teachers, or his doctors. It appears to have assumed that, because of teenage sexuality, the boy is a threat to the health and safety of the other students.